Today marks the first full working day (for most people) since the Opening Ceremony. Transport for London's heat map of busy stations looks like the advanced stages of a game of Battleships, with far more "exceptionally busy" red stations than previous days. Interchanges on the Northern and Central Lines are particularly stressed, and TfL are warning commuters to avoid London Bridge as an estimated 50,000 people head off to Greenwich for the equestrian events. So far, transport services appear to have coped remarkably well. Indeed, over the weekend, getting around town was easier then normal thanks to a lack of engineering works. 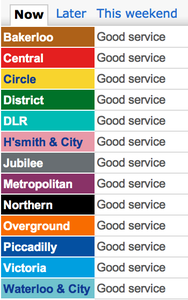 As of 9am Monday morning, the Tube status page shows all lines running well. But what's the reality on the ground (or underground)? How was your commute into work this morning? Did you notice any extra crowding or delays? And what's the situation on the roads and rails? Let us know in the comments below.